Aromatic curry and fragrant ginger infuse the beef in this tasty dish. Stick with the portion size as broccoli portion should be no more than ½ cup. 1 tsp. curry powder (use onion and garlic free version) Click here for onion free variety that you can purchase though I have not used this company yet myself: disclaimer! 1. In a large, nonstick skillet over medium-high heat, combine flank steak, peanut oil and garlic. Stir to prevent the garlic from burning, remove garlic after a minute to infuse some flavor. Cook, stirring often, for 6 to 8 minutes or until steak is browned. 2. Stir in ginger, curry powder, and tamari. Reduce heat to medium-low. 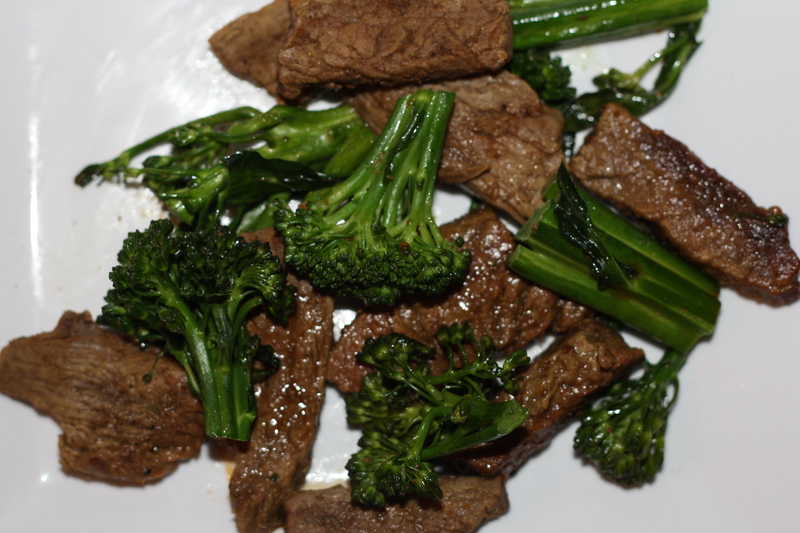 Add ½ cup water and toss in broccolini florets, cover, and cook, stirring occasionally, for 2-3 minutes or until broccoli is desired tenderness. 3. Remove from heat and serve with your favorite rice dish. I made this recipe the other night and my 15 year old step daughter who HATES ginger ate it like there was no tomorrow and gave me the thumbs up to make it again! Absolutely delicious! The only thing I would change next time would be to thicken the sauce a little bit with cornstarch! Not sure if the is low in FODMAPS. Corn starch would be okay on low FODMAP diet. What sort of curry powder is ok? Don’t most have onion & garlic in them – or is the amount too small to cause issue? Doesn’t most soy sauce contain wheat? Or is it such a small amount of wheat that we don’t need to be concerned unless we must also eat gluten free? Yes, many soy sauces contain wheat but in very low amounts…so it’s okay. In fact, the Monash University researchers added 1/4 cup of wheat pretzels to their latest low FODMAP shopping list– this small amounts of wheat is considered okay and is on the tolerable limit. …unless, you are on a gluten free diet which would eliminate any trace of wheat, barley and rye. I’ve always known broccoli to very fodmap Unfriendly. No?